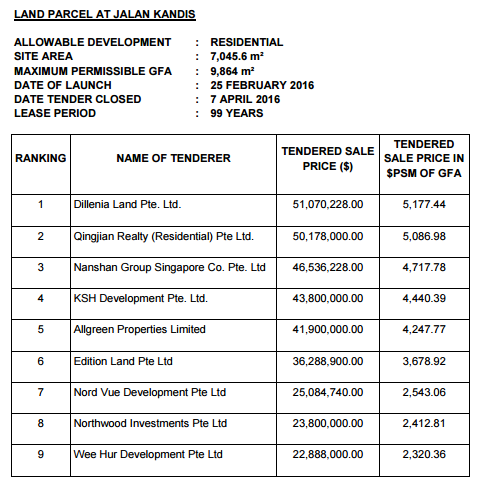 Jalan Kandis is made available for sale on the Reserve List, under 2nd Half 2015 (2H2015) Government Land Sales (GLS) Programme. 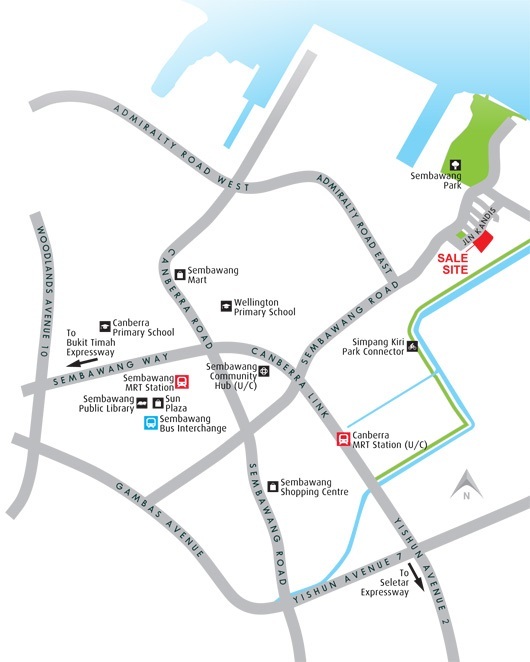 Located within an established residential area and next to greenery such as Sembawang Park and Simpang Kiri Park Connector. Well connected to major roads and expressways such as Sembawang Road, Seletar Expressway (SLE) and Bukit Timah Expressway (BKE) for convenient access to other parts of the island. Residents can enjoy amenities available in Sun Plaza and Sembawang Public Library. Within reach are also established schools such as Canberra Primary School and Wellington Primary School. A 99-year leasehold private housing site along Jalan Kandis near Sembawang Park has drawn nine bids at a state tender. The top bid, from Tuan Sing’s Dillenia Land, was S$51.07 million, which works out to S$481 per square foot per plot ratio (psf ppr). Qingjian Realty (Residential) was the second-highest bidder, at S$50.18 million or about S$473 psf ppr. Also bidding for the site were Nanshan Group Singapore Co, KSH Development and Allgreen Properties. The lowest bid, of S$22.89 million or about S$216 psf ppr came from Wee Hur Development. The 0.7-hectare site can yield an estimated 110 homes in a part three-storey, part seven-storey development. For more information on Jalan Kandis, simply fill up your details below and our salesperson will get in touch with you shortly!